As Leh city becomes increasingly crowded with thousands of visitors every year, any stressed-out corporate executive looking for a laid-back holiday or an adventure seeker looking to scale new heights should head to Nubra Valley in Ladakh, opened only in recent years to outside visitors. 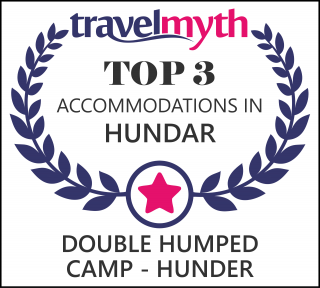 And what better way to experience Nubra Valley than staying with us at Double Humped Camp, Hunder. We have 10 deluxe camps with double occupancy; each tented accommodation has well-appointed attached bath and a separate dining area. Special care is taken to cater to the visitors' choice of cuisine by an experienced chef. It is also fully equipped with a first aid kit. Read on to find out more about what all you can do here, our packages and how to make your stay unforgettable. We have visiting local traditional dance troupe and solo contemporary singer to give visitor gala evening around the bonfire with drinks. Visitor can hone their bar-be-cue skill while having great time with friends at bon fire night. Next morning when you wake up late, take your brunch under sky and soak your feet in ice cold stream zip zapping through our camp. And when you feel you have pampered enough, you can give your hand watering the camp's organic farm. Visitor can experience the double hump Bactrian camel safari on sand dunes surrounded by snow capped rocky mountain. Gaze at the breathtakingly beautiful Shyok and Nubra river maneuver down in vast Nubra Valley plains or drive sharply ascending road to the Diskit Gompa renowned for its exquisite murals and the view from the roof is spectacular. It literarily tranquil one's soul taking refuge to Gyalwa Champa Statue (future Buddha) atop the rocky mountain. A pleasant drive further east to Hunder road brings you to the village of Sumur, famous for its 115 years old Samtanling Gompa. This gompa has been renovated and the H.H. Dalai Lama inaugurated in 1962. There are several interesting restored frescoes and beautiful tangthas on view here. A pleasant drive further up the road brings us to the Panamik village, famous for its hot springs. Copyright© 2012 Double Humped Camp Hunder. All rights reserved.